Note: All translations are unofficial. Special thanks to my linguist friend Loren Wong for help. 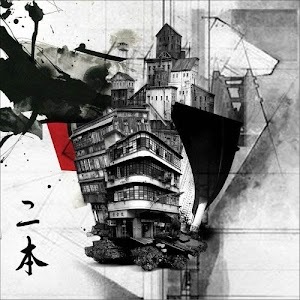 Five Dollar Tux’s (五元兔) second and newest album Urban (二本) is a quintessentially modern Hong Kong rock album with a twist. Entirely in Cantonese, the album’s official description describes it as ‘collection of narratives from deciding local perspectives, documenting sounds and rhythm of the city as well as the cries and murmurs from those who occupy it’. As native Hongkongers, the band has a very particular viewpoint on the sounds and rhythm of the city and that viewpoint is loud, aggressive and dark. The band describes their musical style as ‘fusing classical music with grass root rock and roll’ which although not an entirely original concept in the music world (think Trans-Siberian Orchestra but in Cantonese and you’ve got first prize), it is definitely not something often seen in Cantopop which to this day is pretty conservative with its genres. Much of Urban (二本) (and by extension the Five Dollar Tux repertoire) fits into a Cantonese-Trans-Siberian-Orchestra, if I may reuse an analogy, with classical structures and motifs being played and transformed by heavy punk instrumentation and performance practice. Unfortunately, Five Dollar Tux’s indie status is what makes it fall short to their international counterparts as they don’t have any acoustic classical instruments to play their classical instrument parts, possibly due to a budget restriction or by being a moderately new indie band, leading to an occasional Nintendocore sound. Hong Kong is not at any lack of classical musicians, in fact all the members of Five Dollar Tux were classically trained, so it comes as a surprise that the arrangements don’t include them. Urban is split loosely into two halves: The first half is a three song series prefixed ‘Urban Jungle (石林)’ (Urban Jungle: The Forest (石林：森林) ; Night (石林：黑夜 ) and Caged Beast (石林：困獸 )). Though linked in tableau of Hong Kong, they are musically completely independent with the biggest difference being in the second song, Night 石林：黑夜, which is %50 atmospheric piano heavy instrumental. The latter three tracks of the album are less descriptions of life in the city but more commentaries on the society, most prevalent in Grass in a landslide: (被傾斜的蔓延之中) a political rap attacking baby boomers, Beijing supporters and the entire middle class all at once. At the beginning of the review I described Urban as a ‘quintessentially modern Hong Kong rock album’ and this description becomes truer the more you listen to the album. It’s not that the music and lyrics are badly written, on the contrary everything is done well but there’s also very little excitement once you get past the initial surprise of mixing classical music with rock. The lyrics are typical angst commentaries on big city life, you see almost identical sentiment in the works of bands such as Green Day or Jay Z, with the exception of Grass in a landslide: (被傾斜的蔓延之中) which mentions Hong Kong in name and the delicate political situation we’re in, this album could be about any urban sprawl in the world. The music, likewise, becomes predictable as the musicians take a classical composition mindset to composing which means lots of repeated motifs and sections. But let’s not end on a bad note. Do these criticisms mean the album is bad? No it doesn’t. The classical writing and clear instrumental performance is a breath of air from other punk bands which often trade clarity for grit. The lyrics also, although unexciting are not bland and, for the most part, work well with the music – there is clear thought given to creating an atmosphere with both words and music which isn’t always done nowadays. Five Dollar Tux has lots of potential and talent. They just haven’t quite hit the mark. the album can be listened through various online portals including iTunes and KKbox!